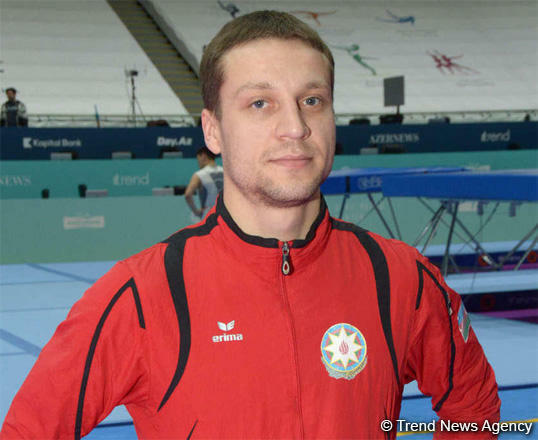 The strongest gymnasts will arrive at the World Cup in Trampoline Gymnastics and Tumbling, which will be held in Baku on Feb. 16-17, Azerbaijani trampoline athlete Ilya Grishunin told Trend. "After an injury the workout is a bit hard, and today it's only the sixth workout. There is little time left, but we count on our experience. Since the Cup is licensed as part of the qualification for the Olympic Games 2020 in Tokyo, the strongest gymnasts will come to Baku," he said. Speaking about the chances of getting into the Cup final, the Azerbaijani gymnast said that it is necessary to perform the program steadily. "In our sport, everything is possible, so you need to consistently go through what you have in mind. I think there will be a chance. Psychologically, I set the task to get to the final, and there I’ll compete for a place in the top three," the athlete added. The gymnast also stressed that he knows what score he needs to achieve in the Cup in order to get a license for the Olympic Games 2020 in Tokyo.